Uman "The usual cloud-to- ground discharge probably begins as a local discharge between the small pocket of positive charge at the base of the cloud (the p region) and the primary region of negative charge (the N region) above it. This local discharge frees electrons in the N-region that previously had been attached to water or ice particles. These electrons overrun the p-region, neutralize its small positive charge, and then continue on their trip to the ground. " This description is based upon the tripolar model of charge buildup. Following a charge transfer event in the lower part of the cloud, the released electrons proceed to the ground. Uman "The vehicle by which these electrons move from the cloud to the ground is called a stepped leader... it moves to the ground in rapid, luminous steps that are about fifty yards long. Each step occurs in less than one-millionth of a second, and the time between each step is about one fifty-millionth of a second. The stepped leader, moving at a velocity of about 200 miles per hour, takes about one-hundredth of a second to travel from the cloud to earth." " Measured photographically, the stepped leader is between one and ten yards in diameter. It is thought, however, that most of the current flows down a narrow conducting core that is less than one inch in diameter, and that the large, photographically obvserved diameter is due to a luminous electrical corona surrounding the conducting core." When the stepped leader approaches the ground, carrying some five coulombs of charge, a large positive charge is induced below it and an upward-moving discharge some 30-50 meters long comes up to meet it. 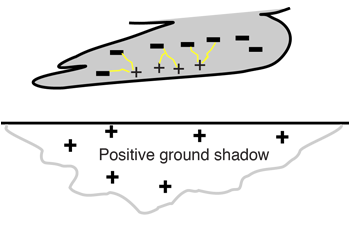 The position of the upward-moving discharge actually determines what ground point the lightning will hit, so lightning rods are used to initiate this discharge to offer some control over the strike. When contact is made with the stepped leader, a violent, high-current discharge travels to ground. This highly luminous discharge then travels back up the leader in the return stroke.